The sanding has begun. 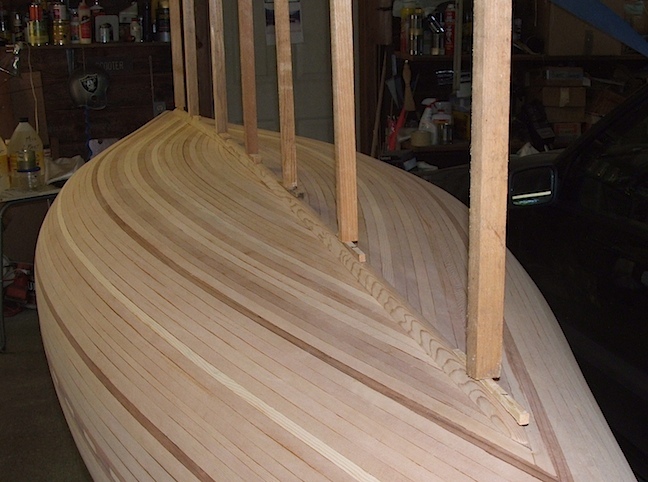 Before sanding however, I went over the canoe with my block plane to take down any high ridges. The ridges appear where the cedar strips come together. Also, some strips are a little thicker than the 1/4" of most. 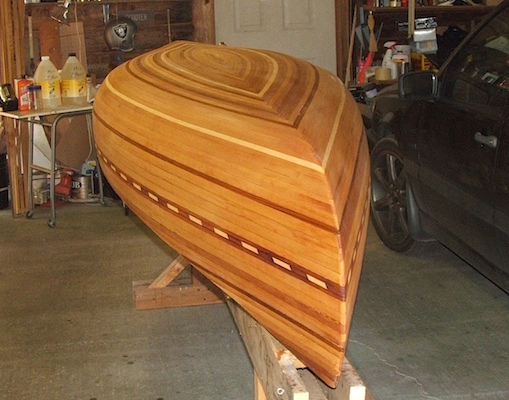 In this picture I have completed the first sanding of about one quarter of the hull. For the first sanding I am using my random orbital sander with #60 grit sandpaper. I had taken a few pictures while sanding but they all seem to look the same, until now. Following the suggestion of Ted Moores, I wetted down the hull with water in a damp cloth. This will raise any fibers that have been pushed down into the surface of the wood. When all is dry again, I'll do one more light sanding with 150 grit sandpaper to remove the fibers. This will make the canoe nice and smooth. 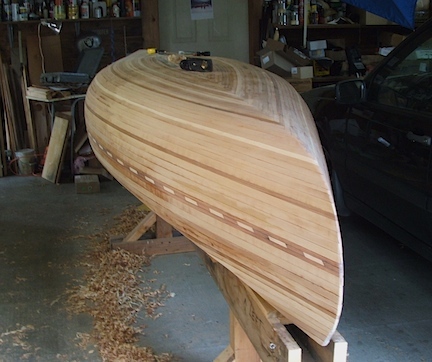 The darkening of the wood makes the canoe appear much as it will after the fiberglass and epoxy have been applied. This step is worth a picture already. Also, wetting the surface brings out any rough spots and areas where glue may show up between strips. These spots can be worked on before applying the fiberglass. 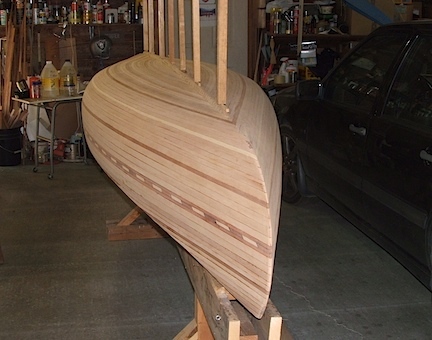 Just one more thing before getting to the fiberglass and epoxy work, the keel. Most wood canoes do not have a keel although some would do well to have one. Sunshine is short and will be happy with a keel to help in tracking. My keel will be installed after the fiberglass and one coating of epoxy is applied. It must be ready to go so here I have done a test install. The vertical sticks go up the the garage ceiling and are forced tightly against the keel with wedges. This will hold the keel in the proper position while the epoxy glue sets. A layer of fiberglass and epoxy will be applied over the keel before the second and third applications to the hull. Click the image for a zoomed-in view of the keel.